When the British first founded colonies in North America, currency was limited to coins whose value was based on their metal content. When the King taxed his colonies to pay for wars in Europe, the colonies looked for ways of financing their own governments to provide services. Since it was illegal for the colonies to coin money, they issued paper notes. These notes functioned as currency but actually were bills of credit, short-term public loans to the government. For the first time, the money had no intrinsic value but was valued at the rate issued by the government of the colony in payment of debt. Every time the colonial government needed money to pay creditors, they authorized the printing of a specified quantity and denomination of notes. Laws authorizing the issuance of notes were called emissions. The emission laws also included a tax that was used to repay the bills of credit with interest. Counterfeiting was rampant by the mid-18th century. In order to combat the problem, Benjamin Franklin devised the nature print, an imprint of a leaf or other natural item with its unpredictable patterns, fine lines, and complex details made it more difficult to copy. To create a nature print, Franklin placed a leaf on a damp cloth. The cloth was placed on top of a bed of soft plaster that pressed the leaf into the plaster. Once the plaster hardened, it had a negative impression of the leaf. Molten copper was then poured over the plaster to make the printing plate. Franklin first used nature prints for the 1737 New Jersey emission. He also used different leaves for different denominations and elaborately engraved borders to further thwart the efforts of potential counterfeiters. Franklin partnered with David Hall printing notes for New Jersey and Pennsylvania colonies. Along with his nature print, Franklin also included the phrase “Tis Death to Counterfeit.” Aside from trying to scare away potential counterfeiters, the penalty for counterfeiting in the 18th century was death. No convictions for counterfeiting colonial currency or death sentences have been recorded. Later, Hall partnered with William Sellers to print Pennsylvania currency when Franklin was sent to England by the Pennsylvania assembly as their colonial agent. Other printers tried different methods to thwart counterfeiters. James Parker of Woodbridge, New Jersey printed notes in two colors. With printing a labor intensive process, it was thought the process to cumbersome for counterfeiters to go through the process of the second printing. Also, Parker used red ink as the second color. Red was more expensive than black ink in the 18th century. 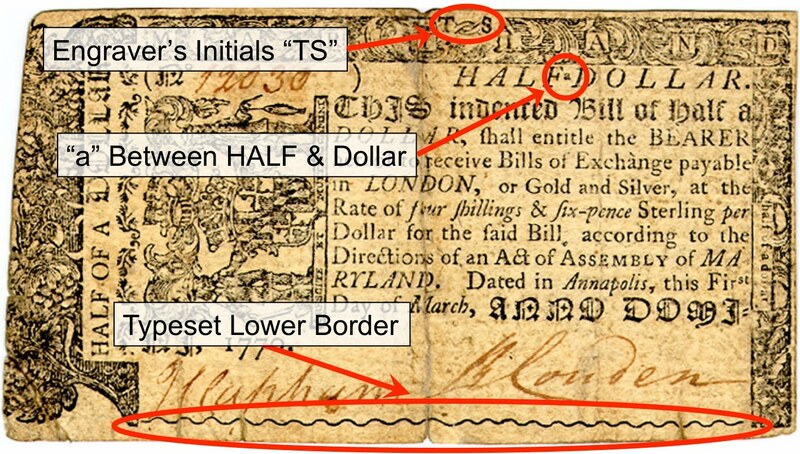 Anti-counterfeiting technology has become very advanced since the colonial days. When the Bureau of Engraving and Printing introduced the new $100 Federal Reserve Note, its anti-counterfeiting technology included a watermark, a security thread, color-shifting ink, micro-printing and a new security ribbon that appears to animate as the note is tilted. Rather than threatening death on today’s notes, our currency is protected under laws enforced by the U.S. Secret Service. The U.S. Secret Service was formed in 1865 as part of the Department of the Treasury following the Civil War to stop counterfeit currency that was printed in an to attempt to wreck the union economy. It was estimated that up to one-half of the currency in circulation was counterfeit. The responsibility to protect the president, vice president, their families, and other national officials was added to their responsibilities in 1901 following the assassination of President William McKinley. Today, the U.S. Secret Service is part of the U.S. Department of Homeland Security with the same mission to protect U.S. money from counterfeiting. They reported that during fiscal year 2009, there were 2,506 domestic arrests for counterfeiting as well as assisting with 360 foreign arrests. This helped remove $182 million in counterfeit currency from circulation proving they are one of the world’s premiere law enforcement organization. Maryland Currency image courtesy of the Coins and Currency Collection at the University of Notre Dame. 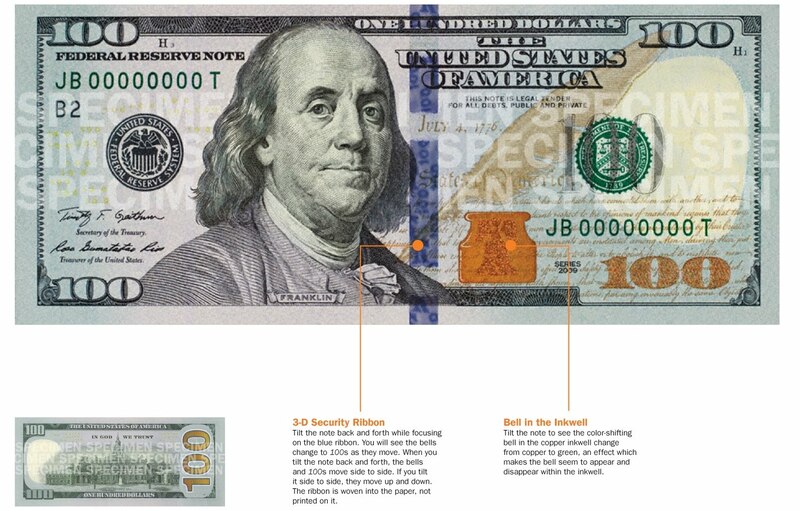 Image of the new $100 FRN complements of the United States Bureau of Engraving and Printing.